Confession: I have never made my own pie crust. The main reason why is pretty simple: it intimidates me. My mom always made her own pie crusts and they were amazing. I live for her Butterscotch Meringue Pie. She lives in Ontario and I’m in Nova Scotia so it’s not really feasible for her to come over to my house and show me how to make my own crust. However, there’s hope for me! Robin Hood has recently introduced a new site, the Robin Hood Baking Centre, and it is exactly what I need to help me become a better baker. RobinHood.ca is the ultimate online baking resource that will help beginners like me to improve their baking skills and give even the most expert bakers inspiration and tips. I’m a full believer in life-long learning and am always looking for ways I can improve. Let me take you on a tour of RobinHood.ca and tell you why I’m so excited about this new site! Currently in the RobinHood.ca Bake Class, you can find a video tutorial showing you how to make the perfect flaky pie crust. It’s like this video was created for me because this is the information I absolutely need to know! The video shows the step-by-step process of what you need to do to make the perfect crust. It shows the measured ingredients required, techniques and lots of tips. It’s also perfectly paced so you can easily jot down notes if you need to. They make it look so easy! It makes me wonder why I was ever intimidated by pie crusts before. After watching the video tutorial, I feel like I’m ready to make my own pie. No more store bought crust for me! My parents are coming down in the next month so I’d like to surprise them with some pie made from scratch. Maybe I’ll even try my mom’s recipe for Butterscotch Meringue Pie? You’ll also find the tutorial written out if you prefer to print it out or read it vs. watching the video. I like having both the visual demonstration and the recipe in writing so I can print it out to reference when I’m in the kitchen. The folks at Robin Hood want you to feel confident in your baking and have shared a variety of tips. There’s the Tip of the Week as well as tips for all kinds of baking including Cakes, Breads & Rolls, Pies & Pastries, Muffins and lots more. I make cookies from scratch a few times a month so that’s the first section I checked out. I learned how to make my cookies crispy vs. chewy and why I should cream my butter and sugar. I like that the advice not only tells you what to do, but also explains why it’s important. 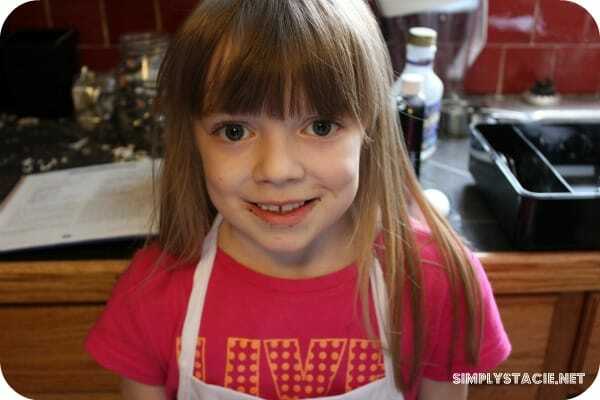 My 8 year old daughter, Bridget, is my little helper in the kitchen. Whenever I’m baking, she’s always right there by my side wanting to help. Her favourite things? Adding ingredients and licking the bowl. The latter I don’t always let her do, but she still asks me every time! In Baking with Kids, you can find easy recipes that you can make with your child. The recipes are easy to follow and don’t have too many ingredients because let’s face it, baking with kids slows you down and you don’t want to be in the kitchen all day! 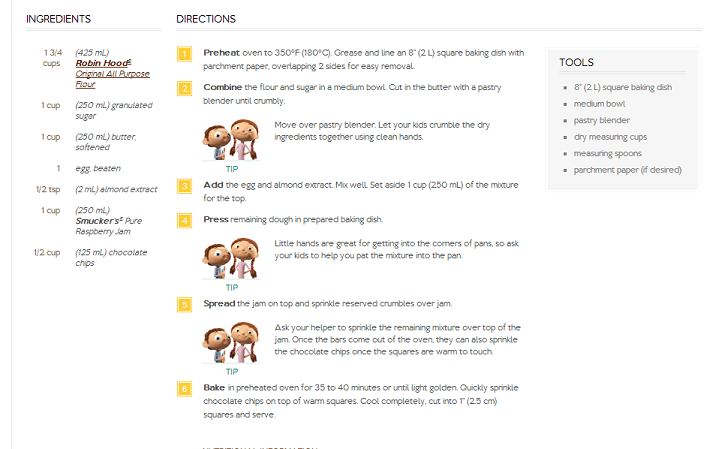 If you look at the individual recipes, you’ll see that they listed the tasks that kids can do while you are baking. Take this Chocolate Raspberry Squares recipe. You’ll see they have a kid-friendly image beside the tasks that kids can perform. You can also set a weekly baking date and receive an email from the site to remind you. It will include a recipe that you can print off and make with your little ones. I think this is something that I will start to do in the fall. The recipes is my favourite section of RobinHood.ca! Warning: you will be hungry after visiting. One can never have enough recipes and I’ve got the Pinterest account to prove it. Search for recipes by category (ie. Cookies, Gluten Free, Cakes & Cupcakes, etc), by occasion (Back to School, Fall Harvest, Thanksgiving, etc), by product (Original All Purpose flour, Whole Wheat All Purpose flour, Best for Cake & Pastry, etc) or by keyword. Each recipe shows you a picture of the finished product, ingredients, directions and even the tools you’ll need to make it. I’ve been eyeing this delectable Pineapple Upside Down Cake. I need to make it! In Products, you’ll find information about the varieties of flour that Robin Hood sells. In the past, I’ve only used Robin Hood All Purpose flour, but after checking out their other products I’m very interested in trying out their specialty flours. They have a Best for Cake & Pastry Flour that I’d like to buy on my next shopping trip and see how it compares to the regular all purpose flour. You’ll also be able to learn how to store each product. I learned that my Robin Hood All Purpose flour has an 18 month shelf life. It also lists substitutions with the types of flours and quantity to use as a replacement. There’s also a Baking Centre community where you can chat with other bakers about recipes, tips and get inspiration. It’s free to join! As a member you can also save your favourite recipes in your personal recipe box and be able to rate and comment with your feedback on the Robin Hood recipes. They send out a monthly newsletter full of tips, techniques and recipes. If you try a recipe on the site, you can share a photo of it in the community and tell others about your experience. I love to bake and would love to be able to do it with my nephew! Thanks for the info. This site is lovely, bookmarks since I know I’ll use it often! My mom would absolutely love it if I learned how to make mincemeat pie, because she misses my grandmother’s recipe and there’s a couple frozen pizzas she swears uses some of the ingredients. I love the name of this facility. It reinds me of the chicken place, “Fryer Cluck”, on the sitcom , “Married…with Children”. This site sounds like an awesome place to learn how to make pie crust. I like baking but some of my stuff has turned out horrible. I would like to learn how to make pie crust and other baked good. I will give Robin Hood Baking Centre a look. This sounds like a very interesting site and I would definitely be interested in the video tutorials you described to share with my girls. Thanks for the info! I love to bake so I will definitely be checking this site out! Wow! I love to bake but I usually just go off of recipes in my cookbook. I’m a visual learner, so I will definitely be using the tutorials on this website in the future. I’ve never been a baker of any sort (maybe a couple of cookies), so this looks like it could help me become one. Thanks for the info. i prefer to bake than cook so I’m loving these tutorials! Will be sure to make use of this! I like the idea of having a tip of the week. That’s an easy way to brush up on your skills. I’m so intimated by baking, I need to look into this. I can use all the help I can get. What a neat website! Love that it has a gluten free section! That pineapple upside down cake looks amazing! I love baking and love learning more so I think this website will come in handy! That is awesome. I love that you can take a class right at home learning how to bake. That’s what I need to do, I’ve never made my own pie crust either and wouldn’t even want to try. There is hope for me too!! Boy what a great site. I too am afraid of making pie crust. I will have to go there and watch to see how to make it. My mother’s pie crust was to die for and that’s my goal. I will be visiting Robin Hood Baking Centre so I can make my apple pie with the perfect crust this fall. Great bonding time and you end up with lots of good memories and a delicious treat! Sounds like a wonderful afternoon. Love how detailed their site is but in a simple easy format. Their product explanations and tips are really useful and things I know are relevant to me. Happy Baking – and eating! I love to bake and have always used Robin Hood flour, the picture of the pineapple upside down cake looks so yummy. I find a lot of great recipes at the RobinHood.ca website and they are so easy to follow. It’s great that you can take a class right from your home!! This will be a great site for My daughter and I. We bake together once a week and new recipes are always great. We cannot wait to try the Oineapple Upside Down Cake. I’ve just recently discovered the joys of baking and can’t wait to check this site out! My pie-crusts have always been store-bought and I would love to make my own from scratch. The pineapple upside down cake photo looks so good! Thanks for letting us know about this site, will check it out for real! I made the Oatmeal Cookie Ice Cream Sandwiches from here and they were a hit! we love making yummy treats! Looks like you guys had a lot of fun! The video tutorials would be great to follow. I could set up my ipad right in the kitchen. I have never been to this site and I am very curious. I shall watch some of their tutorials soon. Thanks for the info. I love baking too and expecially when there is something or some occasion to celebrate.That’s when I go into over-drive.I am very interested in watching the video.You are never too old to learn.Thanks for a great review.I do love Robin Hood flour and use it all the time. It’s been years since I’ve seen Robin Hood flour around here. Guess it might be because we live only 30 miles from King Arthur? Thanks for the site. I’m not much of a baker but there are a few recipes there I will try. This is a great site, thank you for this post. It’s a great site for those who need help baking.